Every ethnic and gender group saw statistically significant gains in math in the 2009 national exam. In reading, the results were mixed--with some groups statistically flat and others making gains--though overall scale scores improved from 2005, and no groups declined. American 12th graders achieved small but statistically significant short-term gains on standardized math and reading tests, according to results from the 2009 National Assessment of Educational Progress (NAEP), released Thursday by the United States Department of Education's Institute of Education Sciences. For the 12th grade assessment, which took place in 2009, 11 states participated in the pilot, involving 1,670 schools (both public and private). Fifty-two thousand students participated in the reading assessment; 49,000 participated in the math assessment. Since the previous reading assessment in 2005, students' average scale test scores increased a modest but statistically meaningful two points, to 288, on a 500-point scale. But the 2009 reading score is also slightly but significantly lower than the scores achieved on the standardized tests administered in 1992 (292 average scale score) and 1998 (290 average scale score). The percentage of students at or above "basic" proficiency remained statistically flat in 2009, at 74 percent. But the percentage at or above the proficient level climbed to 38 percent from 35 percent in 2005. Students at the advanced level in reading also remained flat at 5 percent. In math, 12th grade students again saw slight but statistically significant improvement between 2005 and 2009, climbing three point to 153 (on a 300-point scale). Students at both basic and proficient levels increased by three points each from 2005 to 2009. Sixty-four percent of students were at basic proficiency or above; 26 percent were at proficient or above. Only 3 percent scored at the advanced level, up one percentage point from 2005 (not a statistically significant gain). It's worth noting that numbers for years prior to 2005 are not comparable to results from 2005 and 2009 owing to substantial changes in the later tests. In reading, students characterized as "white" and "Asian/Pacific Islander" saw gains in their average scale scores, while students belonging to other ethnicities remained statistically flat. Some of the gains for individual ethic groups in reading between 2005 and 2009 were substantial. Asian/Pacific Islander students' reading scores rose a full 11 points to 298. White students rose three points on average scale scores to 296. Scores for the other ethic groups were not significantly different from 2005, though every group did see some gains from 2005 to 2009. Black students' scores rose two points to 269. Hispanic students scores also rose two points, to 274. And scores for American Indian/Alaska Native students rose three points to 283. There was a 10-point gap between females and males, with females achieving higher average scores. But males led gains, up three points, to 282. Female scores, while higher than those of males, rose a statistically insignificant two points to 292. In terms of location, at 301, Connecticut's students scored highest on average in the reading category, while students from West Virginia scored lowest at 279 among states participating. Students who lived in suburbs scored highest overall, 292. Other location types were five to six points behind on average: towns 287, cities 286, and rural areas 286. There was a strong correlation between students' scores and the educational attainment of their parents. Among students whose parents did not finish high school, the average reading score was 269. Among those whose parents completed college, the average score was 297. 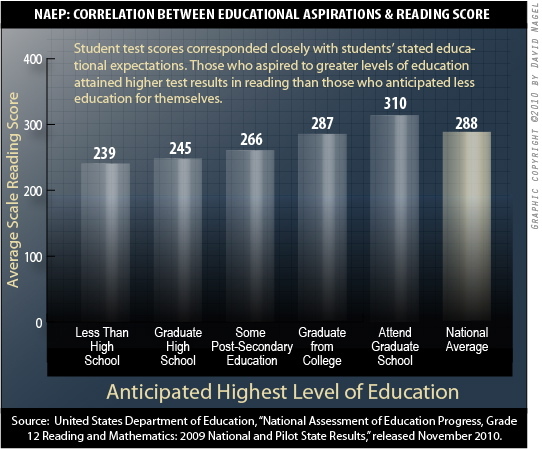 Interestingly, there was also a substantial link between educational aspiration and test results. Among 12th grade students who said they plan to attend graduate school, the average score was 310. Among those who said they don't plan to finish high school, the average score was 239. And, as seen in the figure below, there was a consistent correspondence between each level of self-reported educational goals and eventual test scores. In math, every reported ethnic and gender group--white, black, Hispanic, Asian/Pacific Islander, and American Indian/Alaska Native, as well as male and female--saw statistically significant gains in their average scale scores. As with the reading results, some of the gains among various ethnic groups were not just statistically significant, but also dramatic. Asian/Pacific Islander students again saw the greatest gains from 2005 to 2009 and ended up with the highest average math score, 175, a gain of 12 points. American Indian/Alaska Native students also saw tremendous gains, climbing 10 points to achieve an average score of 144. Hispanic students gained five points to reach 138. White students gained four points, coming in with an average of 161. And black students also gained four points, coming in at 131. In 2005, there was a six-point gap between white students and Asian/Pacific Islander students. This year, Asian/Pacific Islander students outperformed white students by 14 points. The gap between white and Hispanic and white and black students declined by one point each between 2005 and 2009. The gap between the highest-performing group, Asian/Pacific Islanders, and every other group grew substantially. The largest gap, 44 points, was between Asian/Pacific Islander students and black students. The male/female gap remained steady at three points in favor of males (155 on average for males versus 152 for females). Again, where students lived at the time of the test mattered. The suburbs came out on top in average scores at 155. Cities came in second at 152, followed by towns and rural areas at 151 each. There was a 22-point gap between the highest-scoring state (Massachusetts at 163) and the lowest-scoring state (West Virginia at 141) among the states participating. The educational attainment of parents was also once again a factor. Students whose parents failed to complete high school averaged 134 points overall, while students whose parents completed their college degrees scored an average of 163. The complete NAEP results report can be found on ED's site here. Sample questions from various years and at various grade levels can be found here. Sample questions from this year's 12th grade exam can be downloaded in a PDF file here.